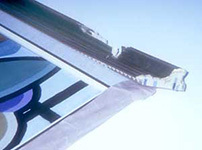 Dented frames, broken glass due to moving and worse, we can document your loss and fix it for you. The difference between a normal repair and an insurance claim repair is the need not only for documentation, but a verification that the work that was done, needed to be done. 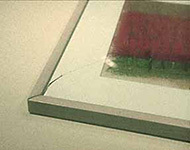 Museum West can verify whether or not the bump or scratch on the frame can be removed or if you need an entire replacement frame. Depending on the claim and the deductible, our designers can often suggest alternatives that will minimize any problems you may have with an insurance adjuster. We can deliver your finished pieces directly to your home or office. If you are in need of an installation, we can arrange for one of the many installers we work with to handle that job for you. For years, Museum West has both assisted in shipping art for collectors to their homes in Europe as well as receiving art to be framed by us for both residential and corporate clients. We have crated and arranged for the shipping of museum exhibits as well as assisted collectors in arranging for the import of their purchases abroad.